I took a look at Gary Engel's checklist and price guide to see if he had any comment about the counterfeits. 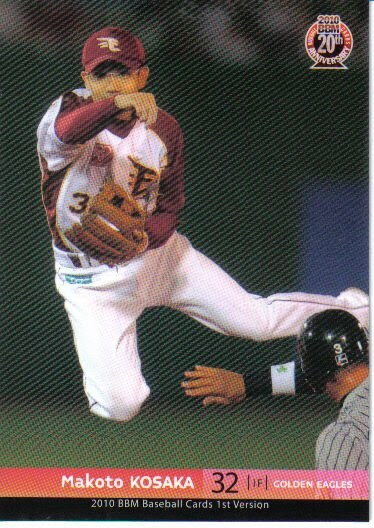 He didn't, but in his comments about the 1993 BBM set, he said that "many cards are often found with a diagonal cut". Great! Mine has a diagonal cut. For the first time since I got the card, I was happy that it was miscut. 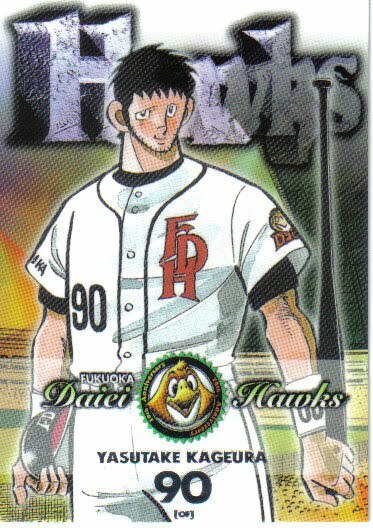 Because I'm betting that if you were going to all the trouble to counterfeit a card, you'd make sure it had a good cut. 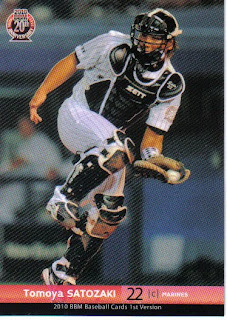 Here's my card (#239 of the 1993 BBM set). You can see that the bottom border has an odd slant to it. I strongly suspect that a card shop in the very touristy part of Seattle is not the only one in the city that carries Japanese cards, but I didn't have time to go anywhere else. Last week, BBM announced yet another new Anniversary set - this time for the 60th Anniverary of the Lions. Now one might wonder why BBM felt it necessary to issue another Lions commemorative set after just doing a couple two years ago in connection with the 30th Anniversary of Seibu buying the team and moving them from Fukuoka to Saitama, but that would almost be as silly as asking why there needed to be a Tigers 75th Anniversary set five years after the Tigers 70th Anniversary set. Anyway, needed or not, the set will be a pack based set containing 99 base cards. 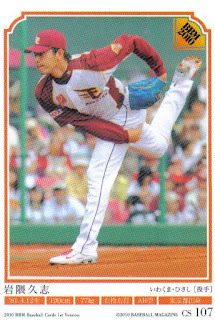 There's six "Team History" cards, 54 cards of OB players (which appear to include both Kazuo Matsui and Daisuke Matsuzaka), and 14 cards for the Lions Classic games this year (featuring current players wearing the 73-74 Taiheiyo Club Lions uniforms). There's also 25 cards that are translating as "Taiheiyo Club Lions" but I strongly suspect are really for the 2010 Lions (since a subset featuring the current team is a standard of the Anniversary sets). There's a club Best 9 insert set and a bunch of possible autograph cards - the example shown is of Frank Howard (I'm hoping that means there's a card of Hondo in the regular set). The set will be out in late August. As this is the 60th Anniversary of the beginning of the two league system, it will be interesting to see what other Anniversary sets BBM decides to do. 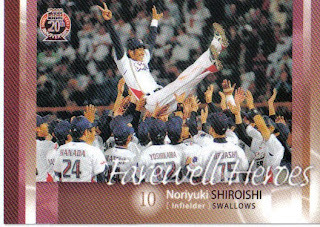 The other teams celebrating their 60th birthday this year are the Marines and the Swallows, both of whom had 40th Anniversary sets for their current owners in the past couple years. 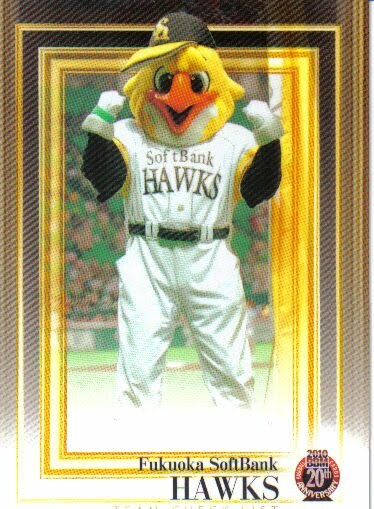 There also has still been no Anniversary set for the Fighters - I guess they could do a 65th Anniversary set since the team first played in 1945 (well, really 1946 - there really was no season in 1945) as the Senators. OK, I've been getting a bunch of questions about this thing I keep referencing called "The History Of Uniform". 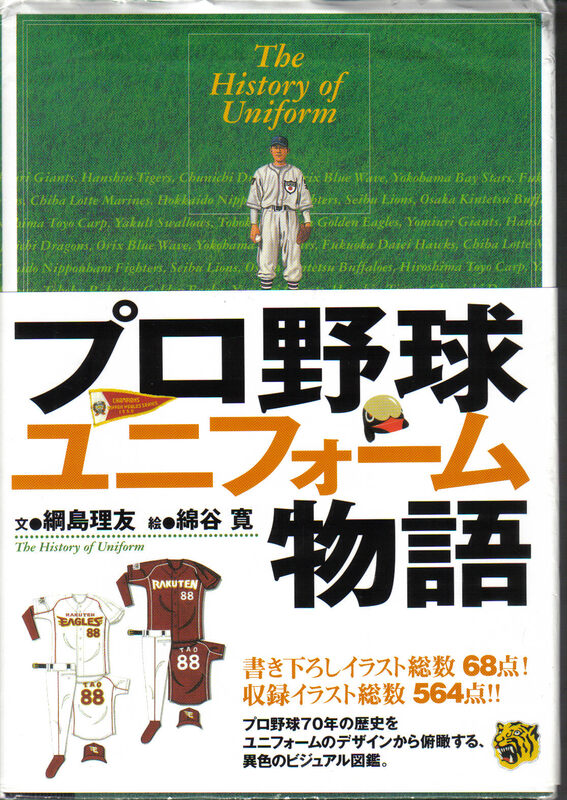 It is a book published in 2005 in Japan that shows the home and away uniform and cap designs for all NPB teams from 1934 to 2005, plus uniforms for All Star teams and other professional leagues (although none of the recent independent leagues). It's written in Japanese, but it's easy enough for a non-Japanese reader (such as myself) to understand enough to figure out whose uniform it is and from when. Bill Ellis has done a little research on the book and passed it along in comments. I'll repeat the information he's related here. I was wrong when I said that the book was published by BBM. It's copy-written by Ritomo Tsunashima and Hiroshi Watatani. I had originally ordered my copy in 2007 from YakyuShop, but I have not seen it offered there since then. Bill provided a link for the book on Amazon's Japanese website - I don't know about whether they will ship to the US or if you would need to go through someone like kuboTEN to get it. I'm not aware of any website that contains the full information from the book. 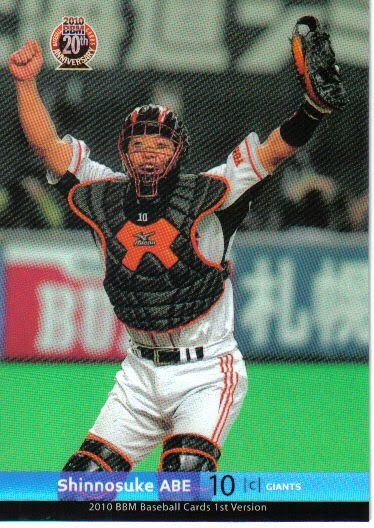 Bill has passed along what I assume is Ritomo Tsunashima's website which contains a couple of items from the book under the Uniform Story link. If you have read this far, you now know everything that I know about the background of this book. UPDATE - Bill Ellis passed on to me how he got his book - he had someone else order it and had it sent to a friend (of the ordering person) in Japan, who then sent it on to the States. I'm thinking that contacting kuboTEN would probably be the best way to go here for anyone without a friend in Japan to go. 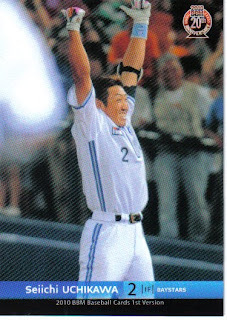 Seibu did their annual "Lions Classic" series last week where they wore throwback uniform. (There may be more games - and there may be a card set - there have been the past two years). 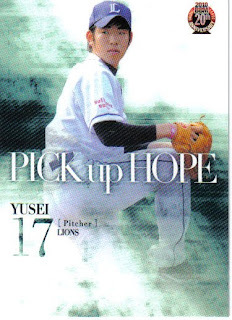 This year, the Lions are wearing the uniforms of the Taiheiyo Club Lions, as the Lions were known from 1973-76. 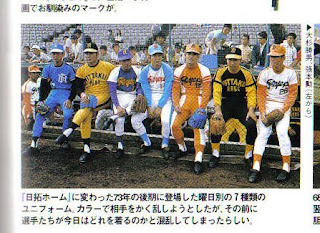 Specifically, the uniforms are from 1973-74, according to "The History Of Uniform". Anyway, Deanna went to a couple of the games and had a couple of posts about it. 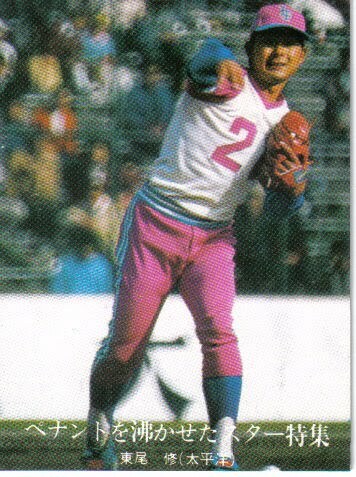 I think Isao Harimoto's in that picture - it's about as undignified as seeing Dave Winfield in one of those late 70's Padres uniforms or when Joe Dimaggio coached for the A's when they moved to Oakland in the late 60's. This is card #1 from the 2005 BBM Tigers 70th Anniversary set. 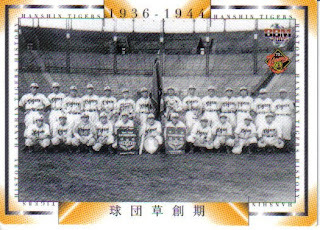 I think it shows a picture of the 1937 team. 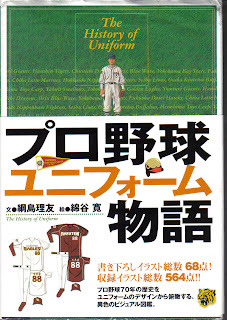 While 1936 is considered the first season for NPB, 1937 is the first "real" season - from what I can glean from Daniel Johnson's "Japanese Baseball - A Statistical Handbook", I think the 1936 "season" was an assortment of tournaments. The 1937 and 1938 seasons were split into completely separate spring and fall season (I'd bet this was because that's how college baseball does things). The Tigers finished a half game out of first in the Spring Season (behind the Giants, of course) and won the Fall Season outright. 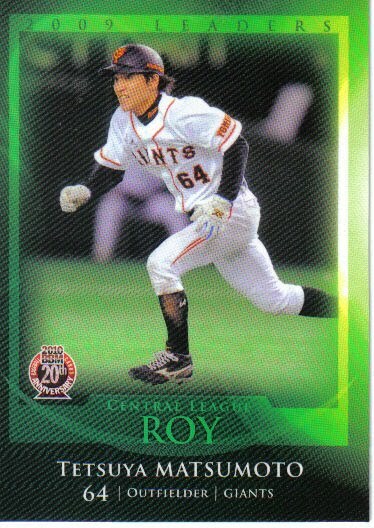 I don't know which team this is a photo of, or if there's that much difference in the rosters of the two seaons. I'll be curious to see what card leads off the new Tigers 75th Anniversary set. BBM announced two new sets on their website last week, both with a bit of a surprise. The first set is their annual All Star set. This box set features all the players who make the All Star teams. In past years, this set has been released to coincide with the games themselves, so the photos on the cards are from regular, run of the mill games (unlike the Nippon Series set, where the photos are actually from the Series). The surprise this year is that the photos will actually be from this year's All Star games, so the set will not be released until late August. The set will contain 67 cards featuring 58 cards of the All Star players, six cards of the managers and coaches, one card for the player who got the most votes (the Carp's Kenta Maeda) and a card each for the MVPs of the two games. (Which means that the 2009 All Star game MVPs - Norichika Aoki and Nobuhiko Matsunaka - will not have a BBM card to commemorate their achievement. 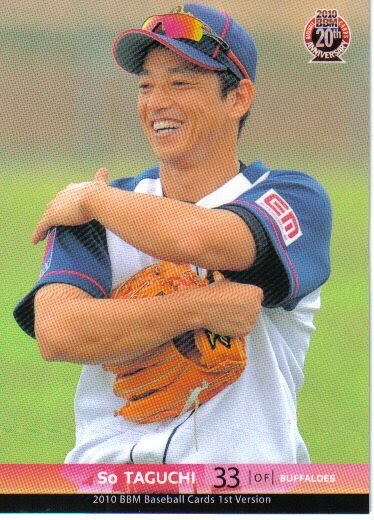 They do have cards in last year's Calbee Series 3 in honor of it, however.) Yakyu Baka has the full All Star rosters here. 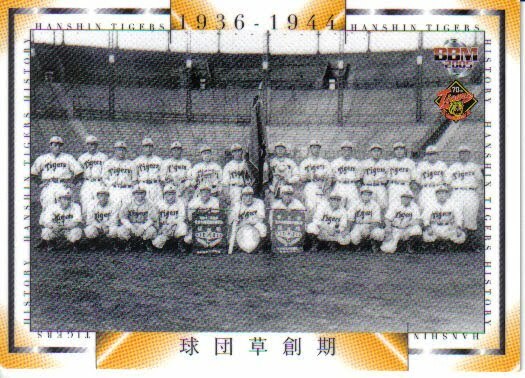 The surprise of the second set, a 75th Anniversary set for the Hanshin Tigers, is that BBM felt it was necessary following the 70th Anniversary set they did for the Tigers back in 2005. (Because no offense to Tiger fans, but I think the only really significant thing that happened for the team in the last 5 years was the recovery of Colonel Sanders...) But anyway, it's a pack-based set that follows the standard BBM anniversary set drill of the past few years - 99 card base set with seven cards for team history, 65 cards of OB players, 20 cards for the 2010 Tigers and seven cards for team record holders. There are two insert sets - nine cards for "key active players" and nine cards for "former superstars" - don't know if they are "Tigers Best 9" sets or not. There's the possibility of three different jersey cards of active players (Kyuji Fujikawa, Shinjiro Hiyama and Tomoaki Kanemoto) and autograph cards of OB players. The set should be out in late August. Well, I'm late as usual getting to this - the set's been out for almost three months and I've had mine for almost a month. This year's BBM 1st Version set contains 549 cards along with a couple of insert sets (including the standard Best 9 and Golden Glove sets) and the assorted memorabilia and autograph cards. It's a fairly typical BBM "regular" set, although a couple of the subsets that I've come to expect have been skipped this year due to the inclusion of the 20th Anniversary "Cross-Stream" subset. The final subset in the set is part of a cross set subset that celebrates BBM's 20th Anniversary. This set includes 36 cards for the "Cross Stream" subset - 3 per team. The 2nd Version and Touch The Game sets will also include 36 cards for the subset and each team set will contain six cards for the subset. So each team will have 15 cards - three from each of the "big" sets and six in the team set. 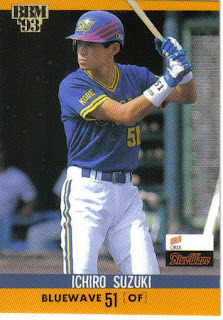 I've been trying to figure out how many players in this set had cards in the 1991 set. So far, I've come up with Koichi Hori, Motonobu Tanishige, Masa Yamamoto, Akihiro Yano, Tomonori Maeda, Masao Kida, and Kimiyasu Kudoh. 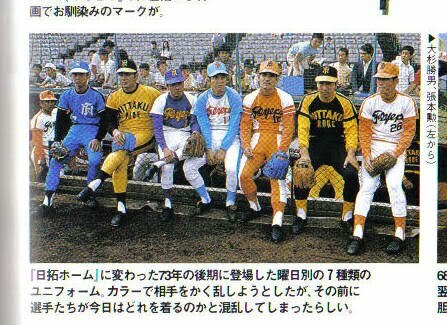 Also most of the team managers except Marty Brown, Shigeru Takada (well, he WAS manager when the set went to press - Junji Ogawa IS in the 1991 set) and Masataka Nashida. 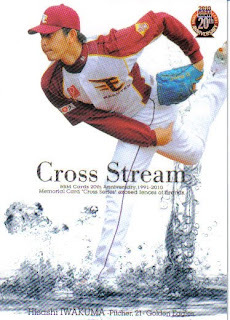 None of the players who appeared in the 1991 set appear in the "Cross Stream" subset (at least for 1st Version). Deanna Rubin recently went to Niigata and, among other things, went to a street that is populated by statues of characters from the baseball manga Abu-san and Dokaben. She mentions that the Hawks have retired uniform number 90 in honor of Yasutake Kageura, the main character from Abu-san.